When you are pushing a bulky stroller along rough terrain, isn’t it very frustrating? You are straining on the combined weight of your baby and the baby buggy. So, if you want to make your outdoor trips with your toddler less hassle and more comfortable for all, get this InStep Grand Safari Single Jogging Stroller that can deal with changing terrain while offering comfort to you and your kid. With 12” wheels in front and 16″ in the back, you can easily maneuver the baby buggy thru tight curves and street corners. The swivel front wheels can be locked in place for added control. You can be sure that you won’t get snagged in the corners because the wheels have zero-degree turn radius so you can quickly move from aisle to aisle when you are at the store or mall. The extra big pneumatic wheels also allow you to jog, stroll or use the stroller on rugged terrain. And you don’t have to worry about your kids’ comfort because the seats are well-padded. The seats also recline so your baby can take a nap in the jogger. The seat pads can also be removed, and there is a grab bar that gives more security to your children. As for the parents, there is a console that keeps your keys, cellphone and beverage accessible. If you are an active parent, this baby buggy is best for you. Not only does it have the needs of the children in mind, but it also has amenities for the parents or the handler of the baby carriage. The large storage basket under the seat can be used for your kids’ things. The steel frame is durable, and it is made of lightweight material for your convenience. Other security features include a parking brake, a tether and a 5-point harness that straps down your kids to their plush cabins. The one-hand fold also helps parents in the managing it’s storage and transport. To keep the person pushing the pram comfortable, the handle can be height adjusted. When all you want is a jog or an outdoor stroll with the kids, you don’t have to make such a fuss over it. When you get this great buggy for joggers, you will be enjoying the moments you are sharing with the kids. The InStep Grand Safari stroller has had many glowing reviews from customers, several of whom mention the sturdiness of the build. One customer said that even after almost 6 years of use, the jogger still looks and works as good as new, and they even had the pictures to prove it. The looks not deteriorating were attributed to the darker colors they bought it in. Countless other customers have commented on the sturdiness of the product and how smoothly it rolls. This was why despite it being a bit on the heavier side, they had had no issues. Along with the durability, a significant advantage plus for many is the color combinations this model comes in, there is something for everyone. Many of the little things about the design are what people have mentioned loving in their reviews. These are features like the simple swivel button for the front wheel, being able to have the canopy wherever you want, the built-in speakers to play music and finally the adjustable height of the handlebar. It seems that every little thing has been well thought out during the creation of this product, and its design has been delighting customers for years. The one small issue some people seem to have is with the weight of the pram. Although some say its weight does not make it roll less smoothly and also makes it sturdier, others say it’s a hassle to haul from place to place. One woman in particular, however, says that even at 7 months pregnant she can lift this pram with ease, so your mileage can vary when it comes to this. Finally, a tiny percentage of people have complained of the product being shipped to them with faulty tubes or deflated tires. This pram also used to be available as a two-seater. Unfortunately, Amazon does not carry it at the moment. 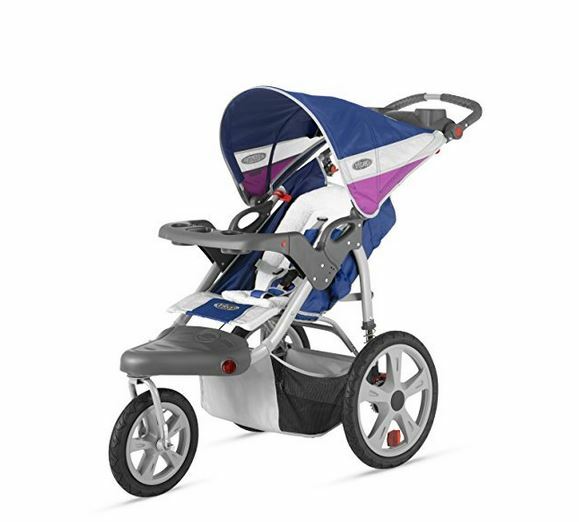 If you are looking for the InStep Grand Safari Double Swivel Wheel jogger, you should check out Walmart and eBay.